Traditional Thai Medicine (TTM) works as a holistic system rather than treating medical issues on an individual basis, as does Western Medicine. It uses methods such as massage, herbalism, spirituality and unique philosophies to address needs of the body, heart and mind. Many people are increasingly dissatisfied with the results and treatments of Western Medicine and are turning to more holistic approaches, such as TTM, for answers. TTM was defined in the Medicine Knowledge Act in 1999 as medical processes that concern anything to do with diseases, promoting and rehabilitating all living things, Thai massage, midwifing, and the use of traditional medicines. Based on the teachings of Buddhism, it emphasizes four elements (or Tard) of the body: earth, water, wind, and fire. When these elements are equal with each other, the body is healthy, whereas if they are not, the body is ill. TTM takes into account various factors when treating the imbalance of these elements that can include variations in seasons, the environment and life events. Doctors who practice TTM are referred to as traditional doctors, whereas those who rely on science-based medicine are referred to as biomedical doctors. A study in 2005 found that 83.3% of hospitals, 67.8% of community centers and 22.4% of health centers incorporated TTM. 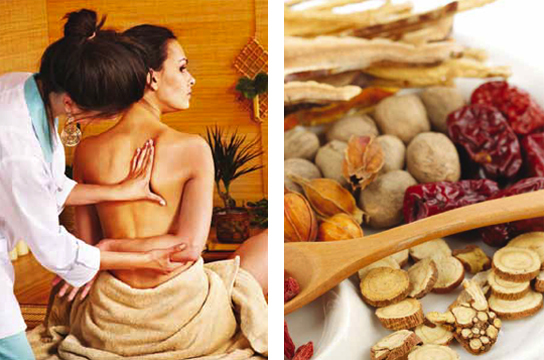 TTM has been traced back to the Sukothai period, where Thai people used it to treat symptoms and promote health. Medical knowledge was then passed through the generations during the Sukothai Ayutthaya, Thonburi and early Rattanakosin periods. However, Western medicine was introduced to the Thai kingdom and TTM was abandoned in 1916. It was brought back around 1978 when the World Health Organization prompted practitioners to include medicinal plants and practices in their health care program. The Vietnam War actually provoked an interest in traditional medicinal practices because our presence in Asia. Old stone inscriptions contained much of the knowledge of TTM, including Thai Massage techniques, stretch exercises, and thousands of herbal recipes. Upon examining the literature, one could argue that there are two existing practices: those done by scholarly practitioners and those done by more rural practitioners who depend on techniques passed on through generations. Since the revival of TTM, a college was founded to teach practitioners of its ways. The college Ayurvedh Vidhayala was founded in 1982 and its name means ‘knowledge of life’. The college offers courses in studying traditional literature and practices, as well as basic medical sciences. The value of Traditional Thai medicine was reevaluated by the Thai government and implemented in to the national health care system. TTM allowed for countries like Thailand, to be self-reliant and make the fullest use of its local and national resources of medicinal plants, indigenous medicine and relevant technology. Modern medicine and procedures are expensive and create a dependency on the health care system for its citizens. TTM can help alleviate some of the stress on the healthcare budget by allowing them to utilize their own natural resources and become self-reliant. TTM enables health care to reach rural areas where modern medicine is limited, yet traditional methods are being lost as the practice dies out. Most people are jumping on the bandwagon for TTM because is has little to no serious side effects as opposed to modern medicine. It’s less intrusive on our body and is a great alternative for those who don’t want to trade one symptom for another. China and India had great success with integrating traditional medicinal practices with modern medicine in their healthcare system. Other countries have since adopted and implemented similar approaches towards health care (Chokevivat, Vichai., Chuthaputti, Anchalee.). Thailand is trying to regain lost customs and reawaken the passion for Traditional Thai Medicine that they had traded in for modern medicine. Many Thai people are skeptical of the holistic approach and would prefer Western medicine to relieve their symptoms as quick as possible. TTM can treat a wide range of aliments, it’s less invasive, cost- effective, natural, and embedded in the Thai culture (Pavlin; Mekala). The utilization of ancient medicinal practices is beginning to surface throughout the world, particularity in the US. Many are turning towards natural, homeopathic remedies used throughout centuries rather then invasive, Western medicinal practices (Thai Medicine Guide). The cost of health care in the US has effected everyone in someway or another in the US and many are starting to gravitate towards traditional, holistic practices to cure their illness. As a whole we are staring to move away from focusing on disease and treatment, and beginning to strive for overall health and wellness. By combining the two practices it ensures we value our health on a daily basis by taking preventative measures with TTM while having a fall back of excellent treatment and care with modern medicine (Chokevivat; Vichai. ; Chuthaputti; Anchalee. ).